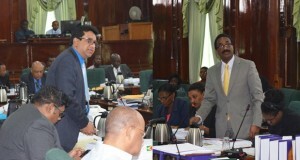 The People’s Progressive Party’s (PPP) Anil Nandlall says Attorney General Basil Williams did not provide his interpretation of the Constitution on who is eligible to be appointed Chairman of the Guyana Elections Commission, but Williams says he needs time to study the case laws presented to him before the two sides meet again next week. “Attorney General, Mr. Basil Williams, was unprepared to put forward his or the government’s interpretation of Article 161 of the Constitution, despite our several requests for him to do so. Instead, he indicated that he will need time to interpret our contentions and prepare his response,” said Nandlall in a statement. Nandlall met Williams in keeping with a decision by Opposition Leader, Bharrat Jagdeo to give into President David Granger’s request for the two to meet to clear up any misconceptions or misinterpretations of Article 161 (2) of the constitution. While Nandlall claimed that Williams was unprepared to state his interpretation of that section of the constitution, the Attorney General indicated that he could not hurriedly state his position without reading the case law that were presented to him. “I invited Mr. Nandlall to present their position and he did that relying on several cases and statutory authorities… Now, after they were complete, in order for me to treat properly with his submissions, I would be required, as in any court, any judge would have wanted an opportunity to read the cases that Mr. Nandlall cited and look at the statues that he mentioned. It would not have been propitious to do that at that time so we’ll have to gather in the authorities, read them to see whether what he is saying is coincident with what the authorities are saying,” Minister Williams said. The Attorney General noted that that while the Government has already established its position it will carefully examine the points, which have been put forward by Mr. Nandlall to ensure that the interests of the country are protected. “I could have indicated to him when you look at constrained, the provisions, one: “there shall” – it’s mandatory it tells that you must first look at the mandatory provisions, which deal with descending order: judge, retired judge, person who could be appointed a judge, who is qualified to be a judge and the …any other fit and proper person and so I could have done that and said, ‘Well I don’t agree with your interpretation but I’m doing better than that because it’s not a question of Mr. Nandlall and I. It’s a question of the people of Guyana and the question of the proper law to be applied for the future in relation these matters,” the Attorney General noted. Nandlall was accompanied by Attorney-at-Law, Priya Manickchand. Minister Williams noted that during the course of the meeting, Ms. Manickchand did, however, concede that it is the President’s prerogative to determine who is a ‘fit and proper’ person, in keeping with the provisions of the Constitution. The Opposition Leader’s nominees has been deemed “unacceptable” by President Granger because none of them is a judge, retired judge or eligible to be appointed a judge. They are Conflict Resolution Specialist, Lawrence Lachmansingh; Attorney-at-Law and Chartered Accountant, Christopher Ram; Retired Major General, Norman Mc Lean; Business Executive, Ramesh Dookhoo; businesswoman and Indian Rights Activist, Rhyaan Shah and History Professor, James Rose.